Connect Bridgeport Benedum Blog: Benedum Blog: Gearing Up for the "Festival of the Century"
Benedum Blog: Gearing Up for the "Festival of the Century"
The Bridgeport Benedum Festival is gearing up for its biggest and best event in many years. As festival chair, I am assisted this year by Vice-Chair Jessicca Lindsay, Treasurer Eileen Frank and Secretary Jason McCall. We’re putting a new spin on our festival by incorporating an Oil & Gas Expo into the event. We will definitely be exhibiting the spirit of Michael Benedum by inviting local oil and gas producers to participate. With the option to set up booths, producers and related industries can distribute literature, exhibit displays describing procedures and products and answer questions about the drilling and extracting process. However, the Expo doesn’t end there. The Oil & Gas producers will submit five-man teams – their “Roughnecks,” if you will – to compete against teams in challenges such as archery tag, sled pull, tug-o-war, mechanical bull competition and more. We are also taking a new approach to marketing and public relations which will have its own committee. Besides the Oil & Gas Expo, other new activities will include a talent contest sponsored by Cava & Banco and chaired by Ashley McCall. Five hundred dollars in monetary prizes will be awarded. Competition is open to all middle and high school students of Harrison County. Interested contestants can call Ashley at 304-838-4865 for more information. We are also bringing back some of the older games of past “Bridgeport Firemen’s Fairs.” Those old enough will remember activities such as dunking booth (except in this instance with local celebrities), bean bag toss, ring toss, dart throw, etc. Of course, we will still provide long standing staples such as the best fireworks in the area, live music, food and craft vendors, Pet parade – chaired by Marsha Jones, cupcake contest; 5K Run, fishing derby, chicken roast, children’s activities and car show. As always, the festival will be heralded by The Benedum Fellows Banquet and Benedum Festival Pageant. This article was written by John Belcastro, chair of the 2013 Benedum Festival. The annual event celebrates the legacy of Michael Late Benedum, "The Great Wildcatter," a major benefactor of the Bridgeport community in the early to mid-1900s. Belcastro will serve as a regular Connect-Bridgeport blogger, keeping the community apprised of plans for this year's event. 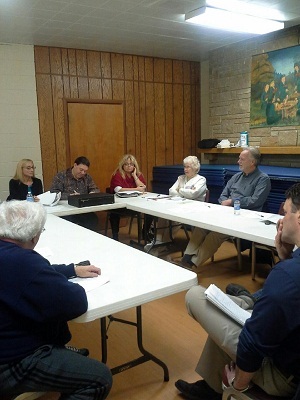 Pictured are members of the 2013 Benedum Festival Committee during the last planning meeting. Photo courtesy of Judi Giffen.